THE City of Prague, the capital of the ancient Crownland of Bohemia, was, and still is, one of the most important and interesting as well as one of the most beautiful of the capital cities of the world. Bohemia covers an area of about twenty thousand square miles (about two-thirds of the size of Ireland) and from its geographical position may be said to have been selected by nature to play an important part in the history of the world and particularly of Europe. It occupies the geographical centre of Europe, being equidistant from all the European seas and is the converging point where the great races of the human family meet, Teuton and Slavonic, Celtic and Mongolian. It was naturally the arena of many a sanguinary conflict all down through the ages and its capital was often the bone of contention over which the nations growled and snarled at each other and was many times the cockpit where their armies settled their disputes by the bloody arbitrament of the sword. The inhabitants, who numbered 6,670,582 in 1921, are a thrifty and industrious people who carry on an enormous trade, mainly in glassware of all descriptions, with the rest of the world. Prague, like many other cities with historical associations of a similar kind, has progressed steadily in importance, in dignity and in beauty. At present it has a population of almost seven hundred thousand and is the seat of many manufactures. It has an industrial fair twice a year and a famous annual motor exhibition. It is one of the greatest aviation centres of the Continent. This splendidly appointed modern city has two other distinctions of which it is prouder than of all the rest; it is the centre of virile Catholicism and it contains the shrine of the Holy Infant of Prague. There were 5,216,180 Catholics in Bohemia in 1921. Czech patron saints, particularly St. Wenceslas, King of Bohemia, are held in great veneration. St. Wenceslas is regarded as the defender of the Czech nation and the most beautiful chapel in St. Vitus Cathedral, overlooking the ancient Prague Castle, has been dedicated to him and enshrines his relics. The statue of the Holy Child Jesus of Prague is one of the best known and most widely venerated sacred images in the world. 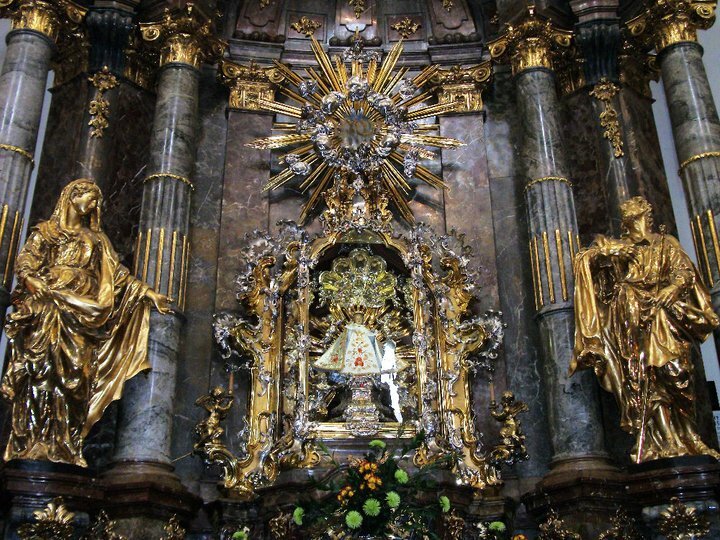 Like almost all the other miraculous treasures of the Church, it had a chequered history before it attained its present fame and became finally and firmly established at its present site in the Carmelite Church of Our Lady of Victories in the City of Prague. By whom or under what circumstances it came to be fashioned is shrouded in the mists of antiquity. The first knowledge we have of it is that it belonged to Princess Manriquez de Lara of the Royal Family of Spain, to whom it had descended as a precious heirloom, and that it was regarded even in her time, and perhaps long before, as the medium through which Almighty God deigned to bestow graces and favours of an extraordinary nature. Princess Manriquez presented the statue as a wedding gift to her daughter, Princess Polyxena de Lobkowitz, who took it with her to her home in Bohemia. It is remarkable that whenever it pleases our Heavenly Father, in His Almighty power and infinite love for us, to open to us, a new avenue of grace and mercy, the powers of darkness invariably rise in arms and by diabolical artifices endeavour to destroy or render impossible of access the new fountain of His beneficence. It is, therefore, not to be wondered at, but is on the contrary a sign of normality, that this beautiful statue should pass through many vicissitudes, suffer indignities and be several times in imminent danger of destruction before reaching the position it now holds in the affection and devotion of pious Catholics in every land under the sun. When Ferdinand II ascended the throne of Austria in 1617 he found his empire in a sad and disquieting state. Protestantism, which had been slowly but steadily making its way into his dominions during the reign of his predecessor, had now established itself so securely that its sectaries were powerful enough to rise in arms against their Catholic Emperor. This was the beginning, of the terrible Thirty Years’ War which devastated the greater part of the Continent of Europe from the year 1618 to 1648. Ferdinand appealed to the neighbouring Catholic princes for assistance, but he did not place all his confidence in brute force. Knowing that without the help of Almighty God he could not hope for any real and decisive victory, and feeling that his cause was the cause of Christ Himself, he appealed to the Pope for prayers and spiritual aid, and begged him especially to send a legate to show his approval and to hearten his Catholic soldiers in their grim fight for faith and king. Accordingly Pope Paul V sent as his legate the Father General of the Discalced Carmelites, Father Dominic of Jesus and Mary, who arrived at the imperial camp on the 20th July, 1620, and immediately took up duty as chaplain-general to the forces. But Father Dominic -was more than chaplain; he quickly became the very heart and soul of the army. A man of great personal holiness, possessed of the zeal of a crusader and gifted with fiery eloquence, he established an ascendancy over officers and men and inspired them with a courage and determination which could not know defeat. One day, while going on his rounds, Father Dominic found, in an old castle near Strakonice, the ancient seat of the monastery of the Knights of St. John, under a heap of refuse, a painting which had been profaned by the Protestants. It was a picture of the Crib at Bethlehem, representing Our Lady kneeling beside the Holy Child, with Saint Joseph standing holding a lantern, and two shepherds in the background. The eyes of all the figures had been stabbed, through with bayonets except those of the Divine Infant. Father Dominic took possession of the picture and brought it around from regiment to regiment showing it to the soldiers and calling on them to prepare to sweep the cowardly and blasphemous enemy out of their beloved country. With this beautiful prayer on their lips the Catholic army opened their attack, and although unfavourably positioned at the outset, gained a victory so complete and decisive that the power of Protestantism in Bohemia was broken forever. So utterly unexpected was the result of the battle that the Protestants themselves were forced to admit that their defeat was the result of a miracle, but, of course, they put their own construction on the source of the super natural intervention and spread the report that “a magician had come from Rome, who, by his sorcery, had overwhelmed them.” It was typical of their illogical mentality at that time, even as it is to-day, that while they scoff at the miraculous as superstition when it comes from above, they are ever ready to give the devil credit for it when it reacts to their own discredit or discomfiture. In gratitude to Father Dominic, Ferdinand founded several Carmelite Monasteries throughout the Empire. In Prague he granted a site for a church and monastery on a terrace of the Malá Strana, one of the most ancient parts of the city. The church was built and was dedicated to Our Lady of Victories on the Feast of the Nativity of the Blessed Virgin, 1624. The church as it stands today is a stately and beautiful building and enshrined above the high altar is an authentic copy of the mutilated painting of the Crib. Over another richly decorated altar in grey marble stands the wonderful statue of the Child Jesus. The statue is enclosed in a glass shrine. It is of wax about eighteen inches in height and is robed in real draperies, richly embroidered, and wears a crown which is beautifully ornamented and studded with precious gems. -It represents the Holy Child standing, His right hand raised in blessing, and his left hand holding a golden globe. The face of the statue, at once childish and majestic, is exquisitely modelled and wears an expression of peculiar sweetness. The altar is continually resplendent with burning tapers, and is never without its group of votaries, for the people of Prague love their Holy Child and go to His shrine with their joys and sorrows, knowing well that He will purify the one and sympathise with and console them in the other; and He never sends them empty away. The Fathers gratefully accepted the statue and placed it in the oratory of their novitiate, where it became the object of their special devotion; the novices took up the devotion with particular enthusiasm. Very soon the prediction of the Princess was fulfilled. Donations began to come in and before the end of the year (1628), Ferdinand, hearing of their dire straits, granted to the monastery a pension of two thousand forms, to be paid from the treasury of Bohemia. This great good fortune, which was regarded by the Fathers as a direct answer to their prayers, had the effect of increasing their devotion to the Holy Child. They met daily for prayer before the statue and went to the Divine Infant as represented by it in all their needs and troubles. The little Jesus continued to shower blessings on the community. Their vineyard, which had hitherto been entirely unproductive, the following year gave an abundance of grapes. Every member of the community felt the influence of the Holy Child. One priest in particular was granted a grace which made him ever afterwards the devoted client of the Divine Infant, and he was subsequently the means of saving the statue from oblivion and probable destruction. This was Father Cyril of the Mother of God. For thirty years this good priest suffered from interior dryness. His soul was like a desert and he performed his religious duties with the greatest aversion, with never a ray of celestial consolation to warm his heart. On Christmas Day, 1629, Father Cyril threw himself at the feet of the Holy Child, and resolving to honour him henceforth as his companion in the Novitiate, besought him to deliver him from his miserable state and give him some interior consolation. His prayer was immediately answered and from that day forward he was able to perform his spiritual duties with fervour and joy. The peace and security the Fathers enjoyed was short-lived: once more they were to experience trials; and, alas for the inconstancy of human nature, their devotion to the Holy Child was soon forgotten. The Protestants, securing the aid of the King of Sweden, again took up arms. Bohemia was invaded and the garrison of Prague in face of superior numbers were forced to evacuate the town. The principal citizens fled also and with them the Carmelites, both priests and novices, escaped to Vienna. Only two of the Fathers were left behind in charge of the church and these were at once arrested. The church was taken over by the Protestants, who, as might be expected showed scant respect for the little waxen image of the Babe of Bethlehem. A year later Ferdinand retook the town and the Carmelites returned, but they re turned to a looted and ruined monastery and a desecrated and much damaged church; and faced with the tremendous work of reconditioning the place they never gave a thought to the little statue which such a short time ago, had been the object of their special veneration. Possibly, if they thought of it at all, they concluded that it could not by any chance have escaped destruction; and, in any case, the novices whose devotion to the statue was most intense, and who would have had more time and opportunity to search for it than the harassed priests, did not return— the novitiate being permanently transferred to Vienna. Once more the community experienced the direst misery. They were even forced again to desert the church in 1634 when the Swedish army took possession of the town. They were able to return .to it in 1635, but their state of destitution did not improve and they found the greatest difficulty in procuring a bare subsistence; repairing or refurnishing the church and monastery was out of the question. For seven years the statue remained unhonoured in the rubbish heap, and for this seven years the Carmelite community remained in abject poverty and distress. Towards Whitsuntide in 1637 Father Cyril was sent back to Prague from Vienna and at the same time the Protestants were threatening a new war. The poor friars were storming Heaven with their prayers that, if it were the Holy Will of God, they might be left at least with the roof over their heads. In this extremity Father Cyril ventured to remind the Superior that formerly devotion to the Holy Child and veneration of the little statue had brought great blessings on the house, and obtained permission to search for the statue. After a considerable delving, among debris in various parts of the monastery he at length found his beloved waxen figure, buried where it had been thrown under an accumulation of odds and ends at the back of the a1ter. His heart was filled with joy, and he eagerly removed all, traces of the dust and dirt, with which the precious statue had become covered, whilst he kissed it affectionately and washed it with his tears. He had no difficulty in obtaining permission to erect it in a place of honour in the oratory, and no sooner was it restored than the heretics raised the siege and an abundant donation of food was received at the monastery from a totally unexpected quarter. Once more the community made their spiritual exercises in the presence of the statue and peace and prosperity returned to their house. The good priest was astonished; he began to wonder if he were dreaming; for he had not noticed that the statue was damaged as it was covered with a mantle which he had not removed. On examining it more carefully he was horrified to find that both its hands were missing. He immediately took the precious image to the Prior and begged permission to have it repaired; but the prior was constrained to refuse, saying, quite truly that they were barely able to buy enough bread to keep them alive and that there were a great many more pressing demands on his slender resources to be satisfied before he could think of spending money on repairing the statue. Father Cyril was disappointed, but he by no means despaired of ultimately attaining his object. Had not the Holy Child Himself asked him to restore the hands of the statue? Clearly the Divine Infant would, in own good time provide the means to have the work done. He went to the Babe Himself with his trouble as he was accustomed to do with all his personal ones. His answer was not long delayed. A few days later he was called to administer the Last Sacraments to a pious and wealthy man to whom he related the whole history of the miraculous image. Deeply touched by his account, the sick man presented him with one hundred florins to have the hands of the statue restored, and Father Cyril went joyfully back, to the monastery, his heart singing paens of praise and gratitude to his dear Holy Child. What was his consternation? However, when the good father Prior, instead of having the precious statue repaired, decided to purchase a new one, declaring that it was more handsome and devotional than the old one. No sooner, however was this statue erected than it was smashed to pieces by a heavy candlestick, which was firmly fastened to the wall, falling upon it. Soon after this the Prior resigned office and was succeeded by Father Dominic of St. Nicholas, a saintly and learned man, to whom Father Cyril brought the statue and renewed his importunities to have it repaired. Father Dominic was, interested, but he was penniless. Father Cyril returned to his cell with the statue, and falling on his knees implored, the Infant Jesus to find a way out of the difficulty. No sooner had he finished his prayer than he was called to the church to see a lady who had asked for him. The lady, who was unknown to him, was of dignified and venerable appearance and she gave him a large sum of money saying that God had taken pity on their distress and sent them this donation. He took the money and began to express his gratitude but the lady suddenly vanished and an interior voice told him that the kind donor was no other than Our Blessed Lady herself. He took the money to the Prior believing that now at last his cherished desire would be fulfilled. The Prior at once consented to have the repairs done, but before there was time to send the statue away further difficulties arose. The repairs to the buildings had cost nearly double the amount the Prior had estimated, and heavy and urgent demands were made on him; the heretics again threatened the city; and as if that were not sufficient the plague broke out and some of the friars died of it and the Prior himself fell sick. So the statue remained in its mutilated condition. Father Cyril was almost disheartened, but he remembered the words he had heard whilst praying before the statue: “Have pity on me and I will have pity on you; restore my hands and I will grant you peace,” and he knew that what the Holy Child wished would one day be accomplished in spite of all obstacles. He examined his conscience to find out if any neglect of his, any undue eagerness, want or other fault had contributed to the present unfortunate state of affairs. Clearly, it must be the Evil One himself who was using his diabolical ingenuity to thwart the wishes of the Divine Babe. There was nothing for it but to return to prayer. Father Cyril took the statue back with him to his cell and prayed as he had never prayed before. The Holy Infant took compassion on His faithful servant. Once more the prayers of the holy priest were interrupted by a voice from the statue and he heard the words: “Place me at the entrance to the sacristy: there someone will have pity on me. Whoever does so shall be well rewarded.’’ He hastened to obey this command and then returned to his cell to continue his prayers. Soon afterwards a stranger calling at the sacristy noticed the broken statue and requested that he might be allowed to take it away and have it repaired at his own expense. The permission was granted and a few days later the statue was returned to the monastery made perfect in every detail. It afterwards transpired that the generous stranger was in great distress at the time of his visit to the sacristy. He had held a position of trust at the Court of the Emperor but was accused of maladministration and dismissed. His home had to be broken up and he and his family were practically ruined. No sooner was the statue replaced on its pedestal in the church than word was received that the Emperor had discovered that a miscarriage of justice had occurred and wished his servant to return and resume his office of commissary. The statue was at last restored to its place in the church, but alas, not to its former position in the devotion of the friars. With exception of Father Cyril, who never wavered in his loyally, the friars were indifferent to its appeal. Hard times and continual dangers had upset their equanimity and besides none of them had personal experience of the bounties and blessings which had followed on devotion to the Holy Child in bygone years. But Our Divine Lord had resolved to bring them back to he simple devotion of children at His own time and in his own way. As we have already seen, the plague was raging in the town, some of the friars had died of it and the Prior himself, whom they loved and reverenced as a father, was lying grievously ill of it. This was Father Cyril’s opportunity. He implored his brethren to come with him and prostrate themselves before the Holy Child and ask Him to spare the life of their beloved Prior. They then went to the Prior himself and begged him to promise that if Our Divine Lord deigned to restore him to health he would establish devotion to the Divine Infant in the monastery. The Prior, moved by their solicitude on his behalf, made the promise and also vowed that he would celebrate Mass nine times before the statue. Immediately a wonderful improvement was noticed in his condition, and he was able to be up and about his duties. This miraculous cure had the effect of inspiring the whole community with love and devotion once more for the dear Babe of Bethlehem, and the Fathers vied with each other in showing their gratitude. Once more prosperity and peace returned to the monastery. For years the provision of the bare necessaries of life had been a continuous strain and often the larder was completely empty and the friars were on the brink of starvation. Now donations came flowing in, and so the prophecy of the good princess Polyxena was again fulfilled and the community literally wanted for nothing. Soon the devotion which brought such blessings on the Carmelites spread through the City of Prague, over the land of Bohemia, and, extending in ever widening circles, reached to the most distant parts of the world. Later the Carmelites had a special chapel built to enshrine the statue, and Father Cyril lived to see it solemnly erected in an appropriate setting in. its new home. He died on the 4th of February, 1675, at the age of eighty-five years. On the 13th January, 1741, the statue was removed to the altar where it stands to the present day, and although another storm of persecution broke out later it has never since been taken down. Even when the Carmelite monastery was suppressed on the 3rd of July, 1784, and numerous ex-voto offerings and other valuables seized the statue was allowed to remain under its costly glass shade, and even the twenty angels wrought in solid silver which surrounded it were not interfered with. The Knights of St. John took over from the Carmelite Fathers the honour and responsibility of guarding the statue of the Holy Infant, and to this day their priests from the Monastery at Malá Strana administer the parish of Our Lady of Victory. They endeavour in every way possible, particularly through the Czech magazine which they publish themselves to support and spread the adoration of the Holy Child. They maintain active contact with English-speaking countries. Such associations bring to mind an event in the relations between the Kingdom of Bohemia and Ireland. In 1631 some Irish Franciscan Fathers, who had been driven from their country by Queen Elizabeth, came to Prague and the following year built themselves a monastery which was called the House of the Hibernians. To this day the adjoining street is known as Hibernian Street. Up to the year 1768 when their monastery was closed they were a very active community. This brochure may fittingly close with the recital of a few of the recorded favours granted in answer to devotion to the Holy Infant of Prague. During the lifetime of Father Cyril, the Baroness Elizabeth of Kolowrat, a descendant of the noble house of Lobkowitz which originally possessed the statue, was stricken with a very serious illness. She had lost her speech and hearing and her life was utterly despaired of when her husband Baron Henry of Kolowrat, suddenly thought of the statue and begged Father Cyril to bring it to the bedside of his wife. The good priest did so, and placed the statue in the arms of the dying lady. At the request of the Baron, Father Cyril consented to leave the precious image in the sickroom for a time, and departed for the monastery intending to return for it later. He had only left the house when a messenger was sent after him to tell him that the Baroness had already recovered her speech and hearing. In a few days she was completely restored to health. In thanksgiving she adorned the head of the statue with the precious crown which it wears to this day. 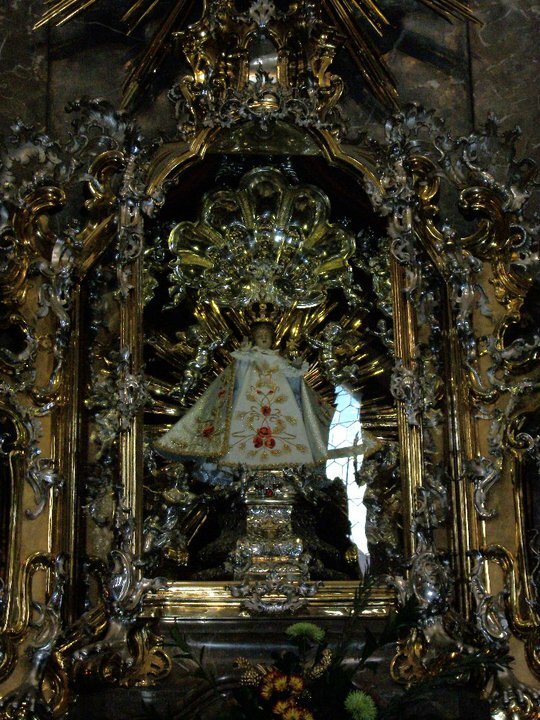 The Baron also gave many rich offerings, and in his will he bequeathed to the shrine of the Holy Infant a beautiful silver lamp and a precious reliquary. In the year 1833, a young girl of Graz, the capital of Styria, lay dangerously ill. She had been given up by the doctors and received the Last Sacraments, when same pious nuns who attended her in her illness brought her a facsimile of the statue of the Infant of Prague. After gazing on it with love and confidence she fell into a deep and tranquil sleep, and on awakening cried out at once: “I am cured. The Holy Child has cured me.” Those around her bed thought that she was delirious and sent for the doctor, who, on examining her, pronounced her perfectly cured. In the year 1752 the young son of Joseph de Viquet, physician to the royal family of Bohemia, was stricken with smallpox which attacked his eyes, so although he recovered from the illness, he had the misfortune to lose his sight. The father seeing that human science could do nothing for the boy took him to the shrine of the Holy Infant where they attended Mass in the church. During the Mass the child suddenly called out: “Mamma I can see the Infant Jesus.” From that moment the boy’s eyes were completely cured. In 1891, M. de Laurens was obliged to leave his chateau in Belgium and go to Montpellier to undergo a very complicated operation, He was suffering from an abscess on the liver and the operation was the only possible remedy which offered a chance of saving his life. When his family physician went to remove the bandages in order to allow the specialist, Dr. Dubreuil, to examine the patient, what was astonishment to find that all trace of the disease had disappeared. “If it were possible for the operation to be performed without leaving a mark,” he said, “I should say that it had been done. It is extraordinary. Did Our Lady of Lourdes do this? “No” replied Madame de Laurens, “I must attribute this cure to a novena which I had made in honour of The Holy Child of Prague.” “Well said the doctor, “it is certainly a miracle.” At Brixton, London, an English lady, Teresa Bader, was threatened with blindness. A Mass was celebrated at the Shrine of the Holy child, and a picture of the miraculous statue was placed on her eyes and she was completely cured. In order to better encourage devotion to the Divine Infant, you are invited to visit the Institute’s new website, Offerings for the Infant King: http://infantkingoffering.org/. O Child Jesus, I have recourse to Thee By Thy holy Mother. I implore Thee to assist me in this necessity (here mention your request), for I firmly believe that Thy Divinity can assist me. I confidently hope to obtain Thy holy Grace. I love Thee with my whole heart and my whole soul. I am heartily sorry for my sins, and I entreat Thee, O good Jesus, to give me strength to overcome them. I resolve never again to offend Thee, and to suffer every thing rather than displease Thee. Henceforward I wish to belong to Thee and to –serve Thee faithfully; and for the love of Thee, O Divine Child, I will love my neighbour as myself. O Jesus, most powerful Child, I again implore Thee to assist me in this necessity (mention it). Grant me the grace of possessing Thee eternally, with the holy Angels and Saints Amen. O most Holy Infant Jesus, desiring to honour Thy most Adorable Infancy, which was the first state upon earth to which Thou didst subject Thyself for my salvation, I, though a most unworthy sinner, choose Thee this day in the presence of Thy Blessed Virgin Mother Mary, and of St Joseph, Thy most faithful Foster Father, as my King and my Lord; and I firmly purpose to love and serve Thee always, and to honour Thee especially in this state in which Thou, O Word Eternal, Immense and Infinite, wert born a little babe for the love of me. Ah! be pleased, most loving Babe, to bless this my respectful offering, and give me grace to depend henceforth wholly upon Thee, as Thou in all things didst depend upon Thy Virgin Mother, and St. Joseph, so that I may be fit to be a servant in Thy Holy Family on earth, and then be admitted to the citizenship with the Angels and Thy Saints in Heaven, and therefore do Thou bless me, save me, and help me. Amen. Five Glorias, in honour of the Heart of the Infant Jesus.